Learn more about the Lorex 3-Megapixel Motorized Varifocal Dome IP Camera. Get pricing, and answers to common questions. The Lorex 3-Megapixel Motorized Varifocal Dome IP Camera features a 3MP image sensor, and 2k video resolution cameras equipped with night vision capabilities. This Lorex business security system's adjustable 33°-93° camera view offer extensive coverage that will capture useful evidence in the event of an incident. 140 ft. maximum night vision range. 3MP motorized varifocal security camera. Pros: Superb resolution and frame rates, and great auto-focus capabilities. Cons: The motion sensors don't always detect objects moving. Bottomline: Fantastic security solution that offers peace of mind for your business. 90 - 140 ft. / 27 - 43 m.
What are some alternatives to the Lorex 3-Megapixel Motorized Varifocal Dome IP Camera? Where can I buy the Lorex 3-Megapixel Motorized Varifocal Dome IP Camera? The Lorex 3-Megapixel Motorized Varifocal Dome IP Camera is available via Amazon and the Lorex website. Does the Lorex 3-Megapixel Motorized Varifocal Dome IP Camera work at night? Yes. 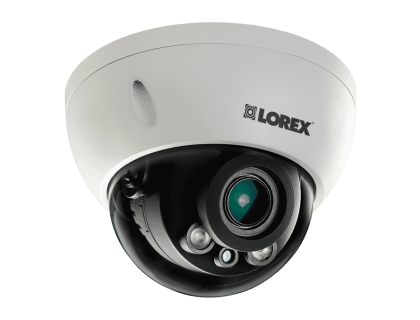 The Lorex 3-Megapixel Motorized Varifocal Dome IP Camera features enhanced night vision that can see up to 140 ft. in ambient lighting with 2k resolution. Can the Lorex 3-Megapixel Motorized Varifocal Dome IP Camera be used in any weather? Yes, the Lorex 3-Megapixel Motorized Varifocal Dome IP Camera has IP66 weatherproof ratings, and can be used in any weather. The combination of a corrosion-resistant aluminum casing and vandal proof designs offer greater outdoor protection and can operate in extreme temperatures, ranging from -22 °F to 140 °F.